Note the man in the background who is apparently importing a refrigerator into Laos. Entering Laos on a little rickety boat sounds pretty clandestine and dangerous, I know, but the whole immigration procedure was smooth and easy. A big group of German old people did it right before me. One side of the river seemed much the same as the other side, really. The only “wow im in freaking laos” moment I had was when I changed some US dollars into an enormous stack of Laotian kip. The exchange rate is something like $1 = 9500 kip, and the biggest bill they have is for 20,000.
when you ride in one you wear a crash helmet and a life preserver. I guess they kill a few people each year when they hit floating debris and disintegrate on impact. So naturally, being a total wuss, I took the slow boat. 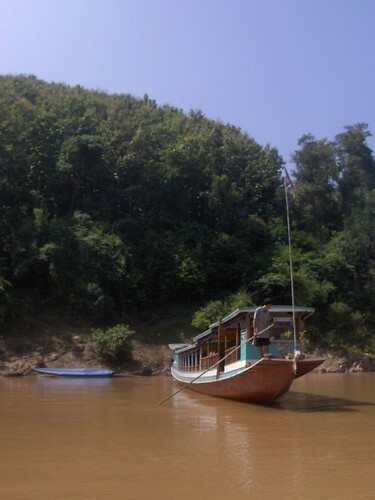 And as it turned out, I was glad I did because the Mekong is not a calm river. Even now in the wet season there are tons of rapids and swirlypools and eddies and all kindsa obstacles that would have freaked me out had I been barreling along in one of those fast boats. Plus the scenery was beautiful. 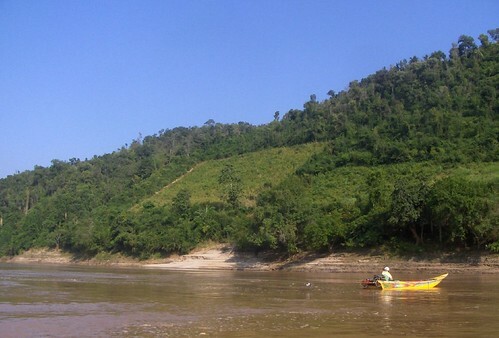 All incredibly dramatic lushly forested hills dropping straight into the muddy brown Mekong. And all along there are little shacks and houses in the most inaccessible locations imaginable. It was a bit weird to think about how the people who live there and work in those hillside fields probably spend their whole lives right there in that very spot, and here’s me chugging through in five minutes on my slow boat, taking pictures to remember the place I’ll never see again. And it was a very slow boat. It stopped at all the little villages along the way to pick people up or make deliveries or whatever. You really got an idea of what commerce on the Mekong is like. There were fruits and bundles of wood, and even livestock delivered to many of the little hamlets. On one occasion a man threw a bag off the boat and it started screaming like crazy, which got everyone’s attention. He opened the bag and revealed a live pig with its legs bound together. Imagine a boatload of Western tourists looking on as a pig is dragged by its bound legs across rocks and up the rough hillside to whatever its fate might have been. I swear that pig screamed just like a little child. We stopped for the night in tiny, tiny Pak Beng, whose sole business seemed to be providing guesthouses for the dozens of slow-boaters stranded there for the night. There wasnt much to it, and the electricity shut off at 10pm. But my accomodation for the night was not quite $3, and you cant really beat that. 8 hours a day for two straight days might sound like a really uncomfortable, annoying ordeal, and it partially was. 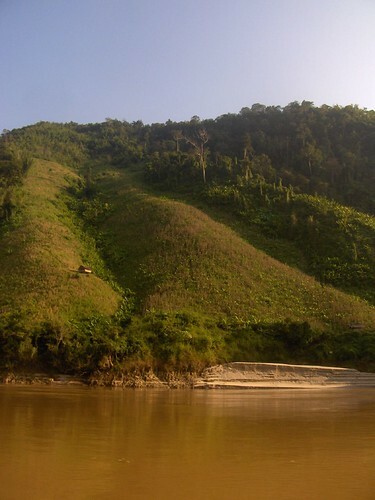 But I made friends with the people sitting around me, who I then later hung out with in Luang Prabang. I read an entire novel. And if there’s any one thing I’m really good at, it’s sitting in one place for long periods of time, thinking about nothing. So that’s what I mostly did. 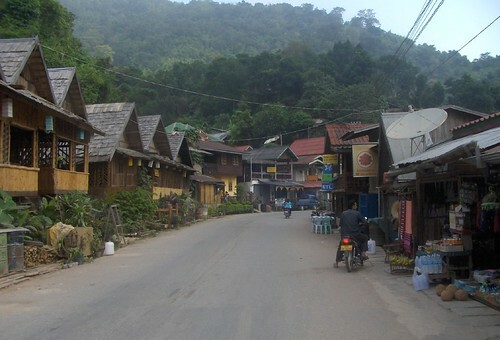 So it was a great way to journey from tiny, backwater Huay Xai to bustling, cosmopolitan Luang Prabang. Like my own little personal Heart of Darkness, but in reverse. What side of the road you drive on is only important in countries where people actually obey the traffic laws. In Southeast Asia, stoplights are suggestions and every road has an invisible middle lane right in the center that everyone uses unless a collision with an oncoming car is imminent. Or about a million different motorcycle lanes that are all constantly occupied. However, I have now left Laos via the Thai-Lao Friendship bridge outside Vientiane (my blog’s a little behind-the-times), and have been through that crossover in your picture. It’s basically like the road splits and does a sort of figure-8 crossing, with a stoplight at the crossing point. My bus went right through the red light, and just like that we were back on the left again!